"I have two visions for the CSPC project," says Johan Veerman. "The first is that we should be able to maintain the instrumentation and control system proactively, instead of the usual reactive maintenance. The second is to start up the plant flawlessly. On most big projects it can take up to a year to iron out all the small problems, but at Nanhai we want to get it right first time." That's quite a challenge on a site as large as the CSPC complex at Nanhai. In process control terms there are about 60,000 I/O points, of which 16,000 are Foundation Fieldbus devices. There are 200,000 software I/O tags and around 3000 Fieldbus segments. The site has nine Yokogawa CENTUM CS 3000 Control systems, with around 120 field control station (FCSs) between them, and three main control rooms. The startup process began in October and was completed by the end of the year 2005, says Shell China. The project entered its definition phase early in 2001, and received the go-ahead in November 2002. In July 2002 the control systems contract was awarded to Yokogawa, who subsequently helped to define the scope of this massive process automation project. "Now that the project is finished, I am happy with the partnership. 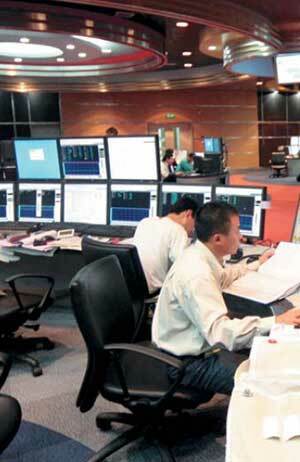 Yokogawa has been very responsible and proactive in handling the project, despite many challenges," Veerman says. "When selecting process automation system suppliers, I think the first consideration is reputation," explains Veerman. "Yokogawa has been very successful in Shell projects in the past, and has earned a reputation for reliability—in people as well as technology. The company is good at listening to its customers and understanding their concerns, and that helps the company deliver maximum value to the project. Out of the three vendors bidding for the Main Automation Contractor (MAC) contract, Yokogawa was technically and commercially the most attractive, and that's why we awarded them the job." 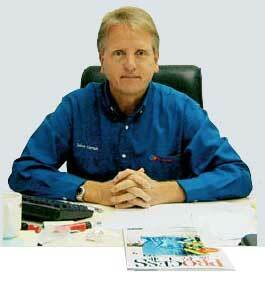 The emphasis on proven solutions applies to equipment as well as companies, says Veerman. For the field instrumentation, CSPC's philosophy was to copy things that have been successful elsewhere, and only use new technology in cases when there were reported problems. Reliability comes first; if something is proven, there is no need to change it. But an emphasis on proven technology doesn't mean a lack of innovation. Concern to minimize emission to the environment, for instance, has led to the widespread use of vortex and coriolis flowmeters— still regarded as new technology in many petrochemical plants. 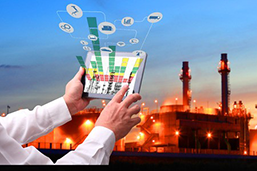 Another example is Yokogawa's DCS Anywhere technology, developed at CSPC's request to allow engineers across the site to access the control rooms via the plant-wide net-work. "It's one of the most advanced plant information networks in the world to date," says Veerman. "Such a level of integration can probably only be achieved in a brand-new plant." "For a flawless startup you need to do a lot of testing in advance—but schedule constraints and construction delays usually make it impossible to do as much testing as you would like. So Yokogawa's Vigilant-Plant concept, with its slogan of: 'See clearly, know in advance, and act with agility' is very important to CSPC." At $4.3 billion, the Nanhai complex is a massive investment—but the money has been well spent, Veerman says: "We have built a world-scale petrochemical complex with an emphasis on quality and high availability. That in itself requires a huge capital investment." CSPC's operating philosophy is to maximize run times and minimize unscheduled shutdowns. This puts emphasis on the quality of the equipment, materials and construction techniques. CSPC has also done a lot to protect the environment and reduce emissions, and that costs money too. advantages of the automation system. Of course CSPC has tried to minimize the total cost of ownership of the complex. To achieve lower operating costs and less lost production, the company has sometimes been prepared to accept higher initial capital expenditure. For instance, the CSPC cracker has been designed for feedstock consisting of a mixture of naphtha and condensate, which is cheaper than naphtha alone. "What's important is that the company should be more profitable than its competitors", Veerman summarizes. The Nanhai complex has three "control centers" (CCs; Figure 1). CC1 controls LOP, SMPO, EO/EG and utilities . CC2 controls HDPE, LDPE, PP and POD/MPG. A separate logistics centre controls the movement of products and feedstock. There are also 15 Field Auxiliary Rooms (FARs) dealing with the control of field instrumentation. A Plant Control Information Network (PI-LAN) connects all the CCs and FARs via fiber optic cables. Foundation Fieldbus (FF) was the obvious choice for communications, says Veerman. "In today's world, it's essential to have networks that integrate with each other and to utilize the information flowing through them. Process instrumentation is being increasingly field networked to deal with the huge quantities of field data. Compared to conventional 5~20 mA systems, field networks are more flexible in terms of wiring, information flow, maintenance and so on. FF doesn't just reduce the cost of wiring. It also transmits a lot of information in an intelligent way, and that makes it possible to do remote monitoring, real-time self-diagnostics and predictive maintenance of field devices, as well as plant resource management using field communication. This will greatly reduce operating costs of instrumentation systems. Proactive maintenance was a key design aim, Veerman insists. "Instrument maintenance is a normally done at the request of the operators," he says. "If someone reports than an instrument is not working, we have to prepare the documentation, go out onto the plant, locate the instrument, test it—and more than 40 percent of the time we find nothing wrong. That's reactive maintenance, and if we can eliminate it then we will cut our costs dramatically. It will also improve plant operations, because the operators will have more confidence in the instruments." So Veerman was looking for a system that would enable proactive maintenance. One tool that can do this was Yokogawa's Plant Resource Manager (PRM), a real-time device management and advanced diagnostics software package which uses Foundation Fieldbus and HART. "PRM allows us to diagnose the instrument and get an alert before it actually fails and causes a process disturbance. "The system checks the health of each instrument continuously. For example, it can verify that the impulse line is clean. When the impulse line starts to foul, the system shows an alarm, and that gives the technicians plenty of time to clean the line before it becomes a problem. This sort of preventive maintenance gives us a more reliable system with fewer suspect measurements, so the operations people have more confidence in the instruments." CSPC's maintenance philosophy is to outsource most of the routine maintenance. "This will attract technical expertise into the area, so it will be good for the local economy, says Veerman." Such a complex project required a carefully-structured approach. At the top level are CSPC partners CNOOC and Shell, and several project management consortia. Responsible for all aspects of control and instrumentation is Veerman, working through a plant automation group (PAG) which acts as coordinator. 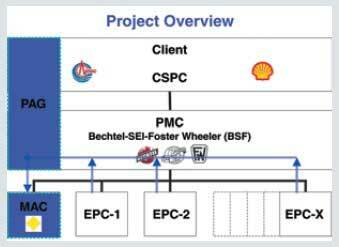 The PAG is the responsibility of a consortium composed of Bechtel, Sinopec Engineering Inc. and Foster Wheeler Energy Ltd.
As the main automation contractor, Yokogawa handled the detailed engineering and configuration of every-thing related to plant automation. Yokogawa supplied not only the DCSs but also, through subcontracts, the safety shutdown systems and the fire and gas protection systems. "Yokogawa also supplied an operator training simulator, and they were responsible for the interfaces to other subsystems such as intelligent electrical switchgear, the rotating equipment control system, tank gauging and analyzers," says Veerman. Execution of the plant automation project was split into four phases. The first of these, the Functional Design Specification, described the project requirements in general terms. The second was the Detailed Design Specification (DDS), which described the functionality of each plant in detail. Phase 3 was the staging and factory acceptance test (FAT), in which all systems were rigorously tested with simulated inputs, and the interaction and communication between the various subsystems was extensively tested. This phase involved more than 200 Yokogawa staff, plus 50 people representing CSPC. The fourth and final phase covered Installation, the site acceptance test (SAT) and commissioning. More than 300 people from Yokogawa, CSPC and the installation contractor worked on this phase. "Managing an automation project like this is like bringing up a daughter," says Veerman. "At the beginning she is all yours, and you can cuddle her. But when she grows up, she has boyfriends, and eventually one of them takes her away from you. At the start of the project you make all the decisions, but as it grows, more and more people join, and they have their own opinions and wishes. You have to realize that they are the ones taking over, and they will be living with the project for many years. So it is important to delegate and involve others." Veerman has worked in many locations all over the world. He has found found the most important thing is that people every-where like to be respected and their contributions welcomed. There are many ways to solve a problem. Veerman's credo: "You are only one part of it. You must respect and accept other people's ways and opinions. Then let them understand your side. The key thing is to be sensitive to the whole framework." Interview: "Costs to Be Cut Down"
CSPC have set themselves the challenge of significantly improving their process yield in the future. PROCESS China-colleague Snowp Lin spoke to Johann Veerman, principal instrument and process control engineer of CSPC about the progress of implementation. When selecting the automation control system, CSPC was applying for Main Automation Contractor (MAC). What is your reason for fieldbus technology? Johan Veerman: In today's world, it is essential to construct networks that integrate with each other and to utilize the information flowing through them. Process instrumentation is being increasingly field networked to deal with huge quantity of field data. Compared to the conventional 4~20mA system, the field network is more flexible with wiring, information flow, quantity, maintenance, etc. FF is not just for reducing the wiring cost. It transmits a lot of information in an intelligent way, thus enabling remote monitoring, realtime self-diagnostics and predictive maintenance of field devices, as well as plant resource management using field communication. This will enable the cost of operating instrumentation systems to be greatly cut down. The project management is very important to determine if the project is successful or not. What is the strategy when you plan the project within CSPC? Johan Veerman: Since this is a big project and the joint venture partners cannot manage all parts of the project, the decision was made to use a Project Management Contractor (PMC). The PMC acts as an extension of CSPC. They manage the realization of the complete project, including engineering of instrumentation, electric, mechanical, civil, service, etc. My responsibility is to take care of the instrumentation and process control. For the control systems, we have formed the Plant Automation Group (PAG). PAG controls all interfaces concerning the automation aspects. For the detailed engineering and configuration of the automation systems, Yokogawa as Main Automation Contractor was employed. Supplying not only to DCS but through sub contract also the process safeguarding system and fire and gas protection systems. Furthermore an operator training simulator was part of the supply. Yokogawa were also responsible for the management of the interface to other sub systems such as intelligent electrical switch-gear, the rotating equipment control system, tank gauging and analyzer to name the main ones.